(Text automatically translated) near the convention center. Large apartment very bright, very quiet and completely repainted. (See tenants comments) In the heart of the historical center, the Palais des Papes. We really appreciated the location of this apartment. Just around the corner was a very good market. The main street was only a 7 minute walk away (10 minutes to the Pope's Palace). Should we go back, we'd probably try to stay here again. Appart super bien placé, très calme. Appartement très agréable, très calme tout en étant proche de tout. Très bonne accueil du propriétaire, beaucoup d'attention de sa part. Annonce et photos conformes à la réalité. Adresse à retenir pour une prochaine visite. Nous avons beaucoup apprécié cet appartement, vaste pour un couple. Bien agencé, bien pourvu en vaisselle, propre. Il est idéalement situé pour les courses, proche des halles, dans un quartier très vivant mais à l'abri du bruit de la rue. Très bon accueil du propriétaire très aimable et serviable. Nous avons passé un excellent séjour dans cet appartement. Nous l'avons d'ailleurs réservé pour le Festival 2017. We are a family with two children aged 18 months and 4 years old and found this apartment excellent for our needs in Avignon. This is our second stay in this apartment and we chose to return due to the very handy location near bakeries and a grocery store, plus the washing machine and good bathtub, both essential items when travelling with small children. Our mission in Avignon was to expose the children to the french language so we spent the month having picnics and going to playgrounds. 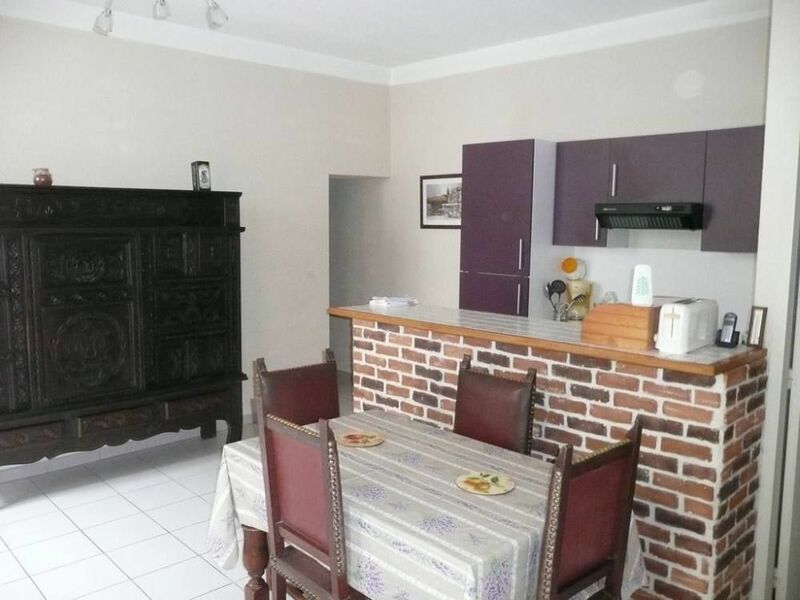 This apartment is within walking distance of everything inside the walls of Avignon and we were able to achieve the goal of an informal french language immersion program, we even started to recognise and establish rapport with quite a few people around town. Taking the excellent transit service to villages was easy, we just walked to the bus stop outside the walls and were off on a day trip! The apartment is basic, clean and bright. I loved the tall windows, natural light, and the same little bird on the neighbour's TV antenna singing in the day each morning. At 18 months old our son is into everything so I appreciated the extra shelving where I could place things out of reach. Though we had to carry the stroller up the stairs, not a big deal, there is just enough space right inside the door to park the stroller so that it is not in the middle of the living area. For early mornings and late nights the electric lighting was a little feeble; there are bedside lamps which I moved on account of the toddler and put one of them in the kitchen which solved the lighting problem there. The bedroom is big so having a camp bed for the 4 year old and a crib in addition to the comfortable double bed did not feel cramped. The kitchen counter is small by North American standards but all the essentials are there and I was able to prepare all our meals with ease. All in all I would recommend this bright, quiet apartment. The handy location and simplicity of the interior decor make it a splendid place for a family with young children. It certainly met our needs as evidenced by the fact that we have had two month long stays there within the past year! (Text automatically translated) Velib in Avignon. Shops. pour les sejours inferieurs à 7 nuits une majoration de 20 à 50 euros peut etre appliquee en fonction de la longueur du sejour.